Personal websites help you to share your experience, showcase your professional work and lot more. Being a professional owning a personal website always keeps you one step ahead of your peers. All your achievements and the quality of your work can be viewed easily on a site. The personal website also helps you to evaluate yourself. Following are the best HTML and WordPress personal website templates you can use to make a smart personal website. 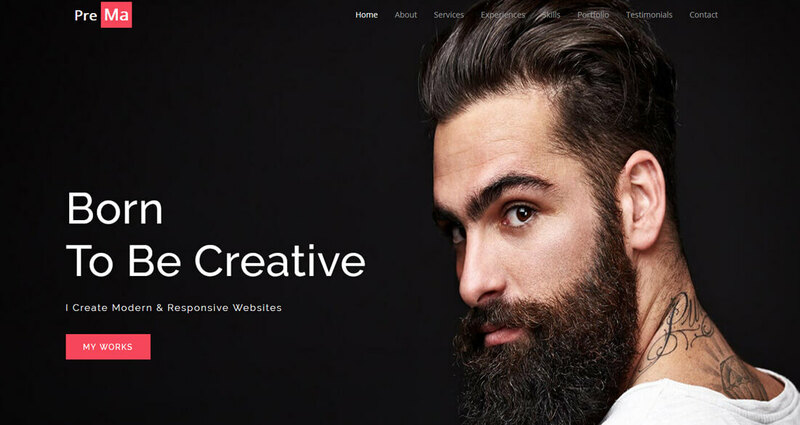 Following are the best HTML templates for your personal site. HTML website template helps you to showcase your work elegantly. HTML templates load easily, especially the templates that use latest HTML5, CSS3, and Bootstrap framework looks modern and also act light on the server. Free personal website templates are economical choices, but you don’t get advanced options and customization support from the authors. 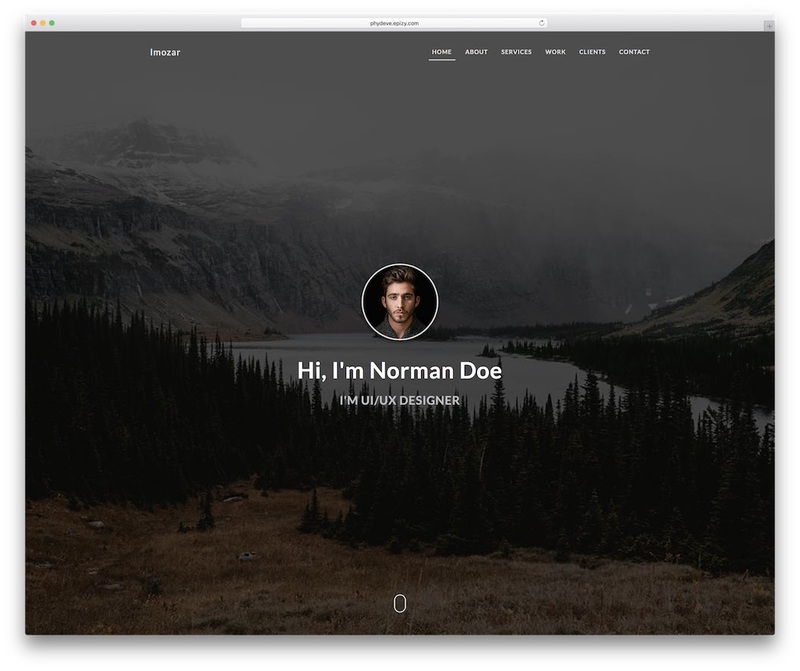 The personal website templates listed in this post are premium templates. If you are looking for a personal website template that is highly creative, modern and visually stunning, Ryan may easily suffice your need. This one-page personal portfolio tool provides you with five remarkable home banner options and twenty color schemes to choose from. Ryan is a customizable and flexible page canvas which you can tailor to your needs with ease. Moreover, since it is built with modern technologies, like Bootstrap 4, jQuery, CSS3 and HTML5, its interface and compatibility is never an issue. Serving as an assurance for customer satisfaction, Ryan is a user-friendly template that is well-commented and documented. Taken altogether, Ryan will make it easier for you to present yourself, your business or idea online. Take action now and have a fully functional page up and live in close to no time. 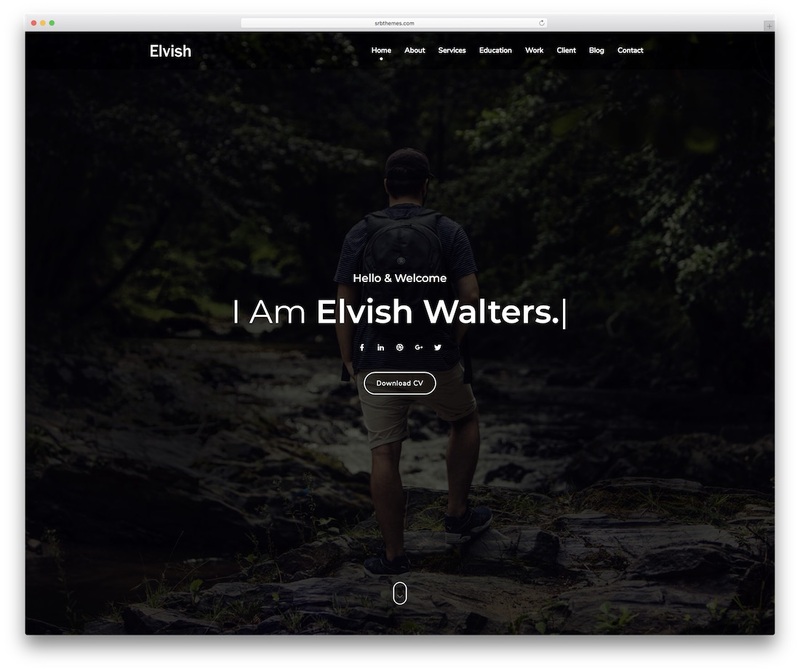 Elvish is a personal website template that you can use to push yourself further and attract new clients to grow your career. While Elvish is best suitable for freelancers, creative agencies and web studios can utilize its powerful web design and assets, too. 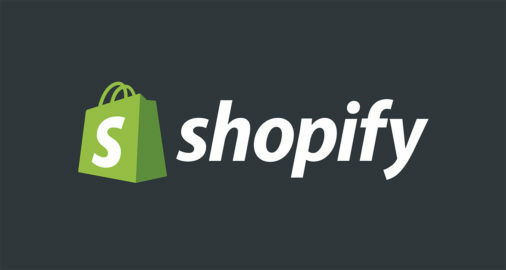 It is a Bootstrap based tool that provides complete responsiveness and compatibility with browsers. That said, regardless of where your visitors come from, Elvish makes sure that your website displays all the content smooth and clean all the time. In the bundle of goodies, Elvish delivers seventeen stylish and enticing home designs. There are a ton of different special effects to choose from or you can go with something more simple and solid. Whatever your idea for the absolute web space may be, it is Elvish that will help you realize it and get your talent and service out there. 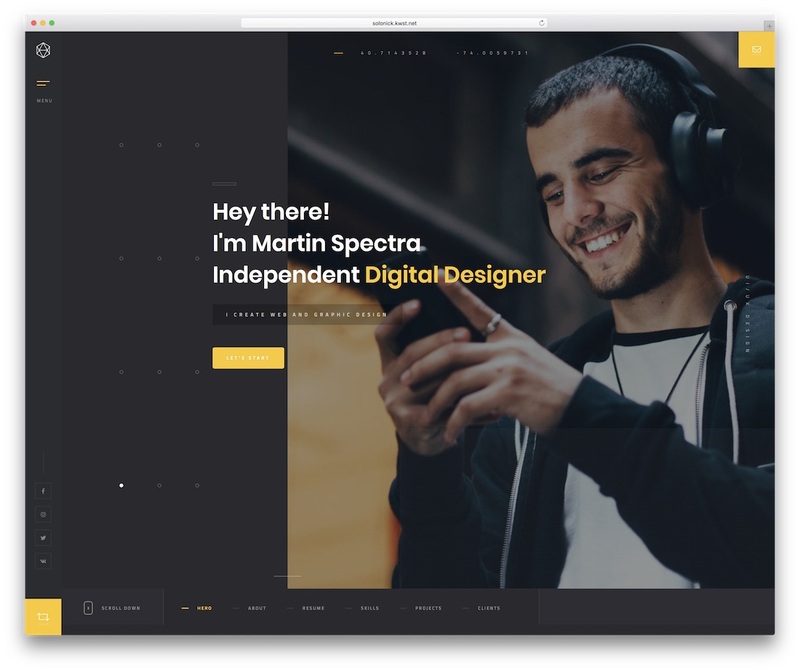 Designed and developed mainly for freelancers and other creative individuals, Imozar is one of the latest personal website templates powered by Bootstrap Framework. 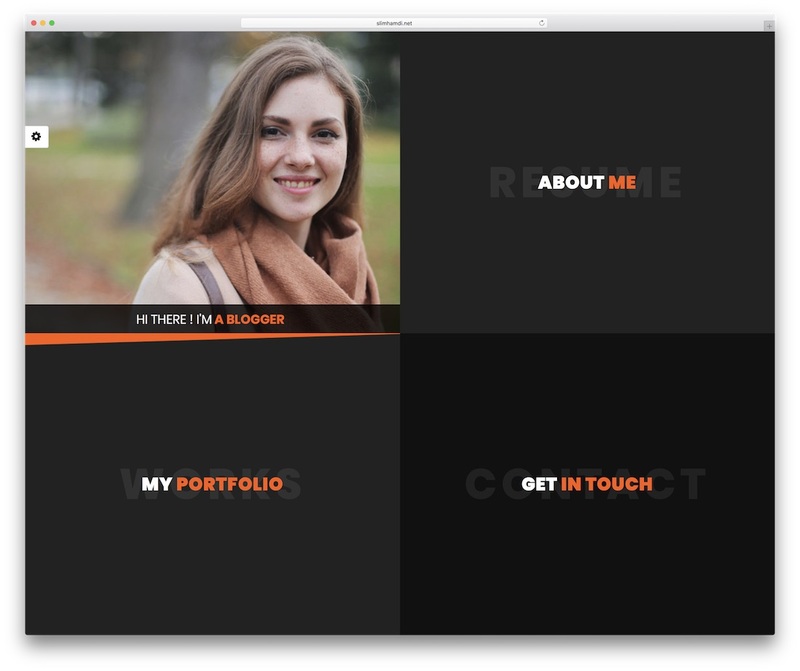 This makes it a fully responsive tool, ideal for an online portfolio or resume. It will showcase your works beautifully on all devices, from smartphones and up to desktops. However, Imozar is not applicable to resumes and personal portfolios only. For since Imozar features a clean, smooth and straightforward look which you can easily adjust to fit your other needs swiftly. With Imozar, you get a whole bunch of amazing features and assets to add to your online presence. 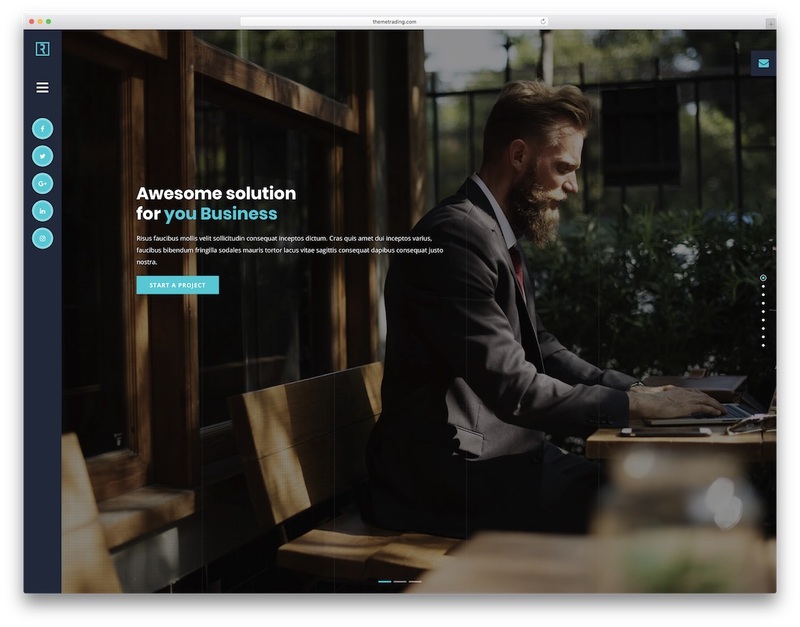 From smooth scrolling, typewriter effect and working contact form to video support, filterable portfolio and testimonials slider. Wait no more and get your internet appearance going strong with Imozar. 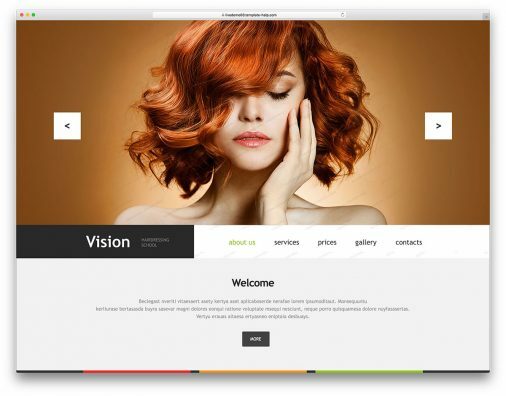 For something not only different but unique, you better consider choosing Solonick personal website template. This tool is an impressive creation that will spark your, but most importantly, your potential clients’ interest. The web design of Solonick is modern and sophisticated with all the necessary elements to complete your website set up in as little time as possible. Moreover, Solonick works with all creatives, like designers, photographers, architects and other freelancers and professional individuals. Solonick comes with eight marvelous index, eight portfolios and nine single portfolio pages, predesigned and ready for use. Besides, Solonick is also responsive, retina-ready and in tune with all modern web browsers for a consistent smooth browsing experience. Introduce Instagram and Twitter feeds, add a video and put the included subscription form to use and march toward success. When in need of a personal website template that is based on Bootstrap to boost your web presence, Vivid can clearly make things happen. What makes this site canvas highly sought is its flexible and simplistic user interface. In short, anyone can use and take Vivid to their advantage even if your experience is not years old. With Vivid’s highly modifiable layout, you can effortlessly adjust it to fit your personal preference. Nearly any niche freelancer who is in need of an efficient and effective template for their website will find Vivid useful. Taking hold of this template also means accessing awesome features such as isotope filtering, active contact form, fast loading speed and 24/7 customer support. Choose between two main demos and start crafting your web space and let Vivid give your talent and skills all the extra shine they deserve. Any creative mind would want their thumbprint on their masterpiece. Runaway shares the same vision. 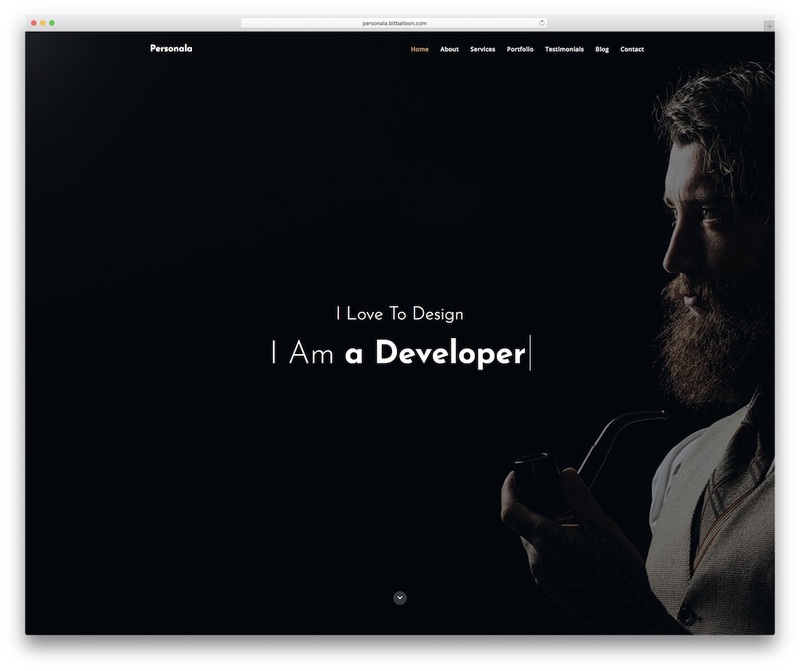 This personal website template is for individuals that aim for perfection yet cannot tolerate complex interfaces. 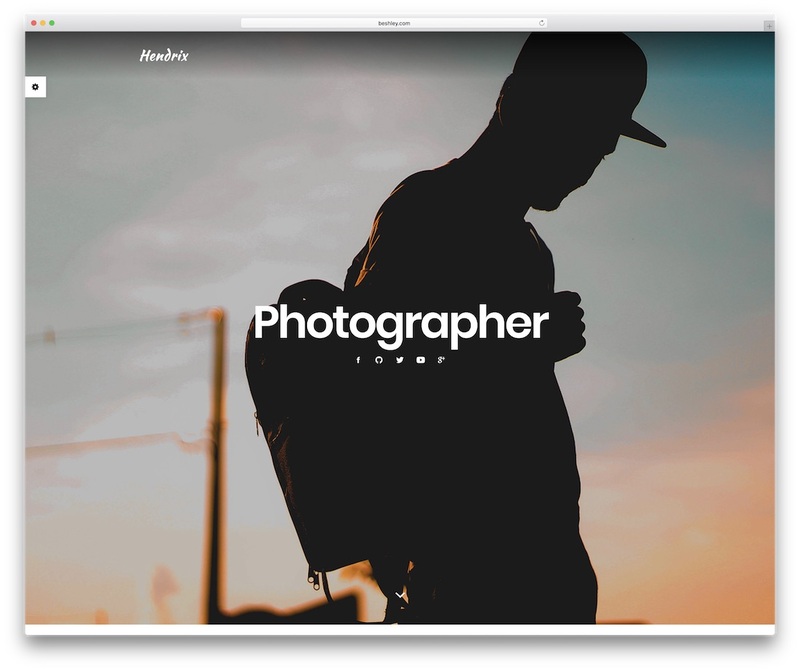 Whether you want a simple gallery, a stylish online portfolio, or a sophisticated look for your website, this fantastic template has the selection of proper demos that grasp your own concept and style. 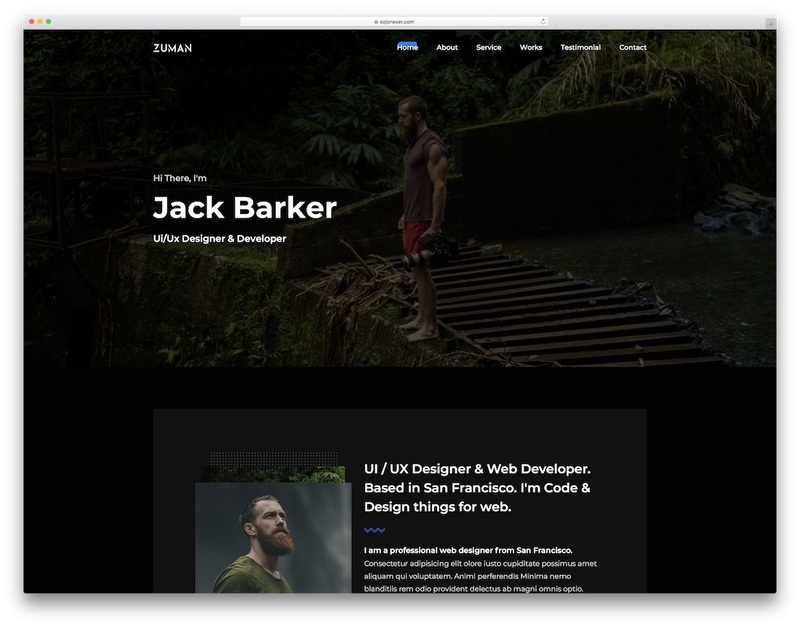 These layouts are not only responsive but pixel-perfect as well. Other core features include free fonts, scrolling options, animations, forms and more. Runaway even has a support team with proficient backgrounds in solving technicalities to sort out your concerns. With such a spectacular, awe-inspiring and easy to use web design, you can start making moves on the web like a professional. Get your name out there, inspire potential clients and score yourself new gigs. A devoted artist knows the value of his or her creations fully. If you are one of those who appreciates talent and wants to monetize from it, the Xcent personal website template gladly opens its doors for you. Since its creation, designers from different fields have relied heavily on this template. Be that all-in-one designer that manages your site, updates your content and promotes your brand at the same time. When you decide to stick with Xcent, you better be prepared for a dose of features that will hit you heavy. From four hero versions, parallax effect, slider, filterable portfolio and on scroll content load, Xcent has it all and loads more. You can effortlessly step things up and fine-tune the layout however you see it fit your needs and requirements best. Xcent is here to realize your online portfolio website regardless of the talents you have. Your vision materializes in the best way possible with Zuman. 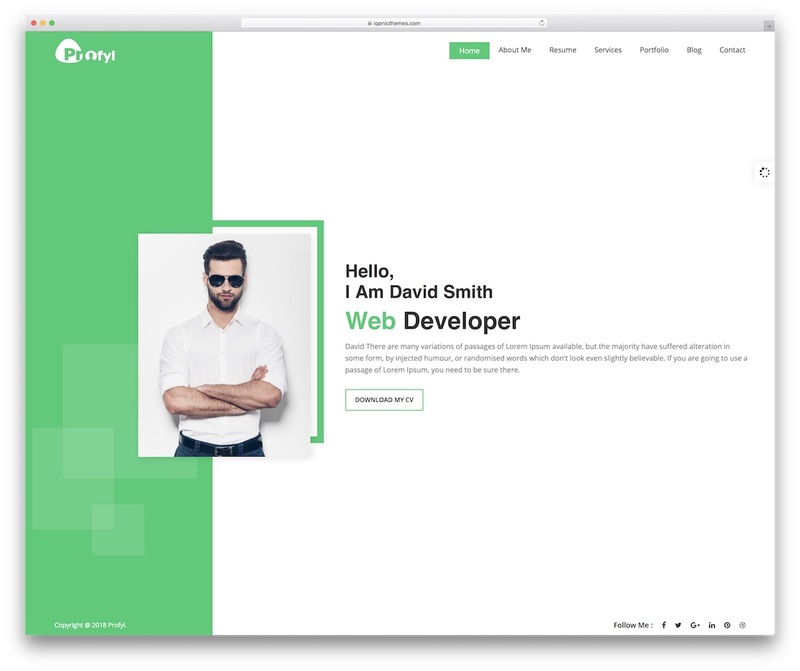 This personal website template is for digital service agencies, companies, designers, illustrators, photographers, freelancers and other creative individuals. Zuman offers a cracking web design that will knock everyone’s socks off. Due to this, your website becomes more interactive and alive instead of being a mere page. On top of that, you can always upgrade the initial design and enrich it with your distinctive style. Zuman enables you to add a personalized touch which can raise engagement among your audience. This template lets you promote your brand by displaying your services and creations in the best possible light. Other features include exclusive work details popup, three home demos, sticky navigation, categorized portfolio and animated statistics to name a few. Give Zuman a go and you will never look back. For individuals or agencies, Personala is a great option for both. It is a personal website template with a single-page layout which showcases all your content just a few scrolls away. No need for a visitor to move from page to page to learn everything about you. 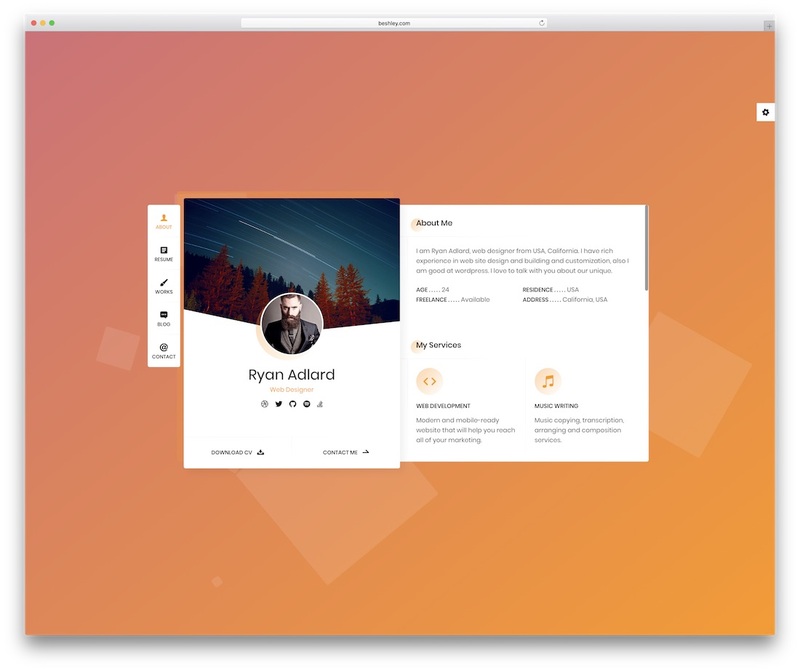 Now you can have it all featured on one page thanks to the excellent Personala template and all its fantastic capabilities. Besides, due to its 100% mobile-readiness, all your content will look striking no matter what device they use to surf the web. Personala has a dark and a light layout predesigned, parallax and typewriter effects, call-to-action buttons, animated statistics and categorized portfolio section. Furthermore, you can also start writing a personal blog, let your clients speak about your services and allow all potential customers to get in touch with you using the included contact form. Self-expression nowadays requires the best platform. 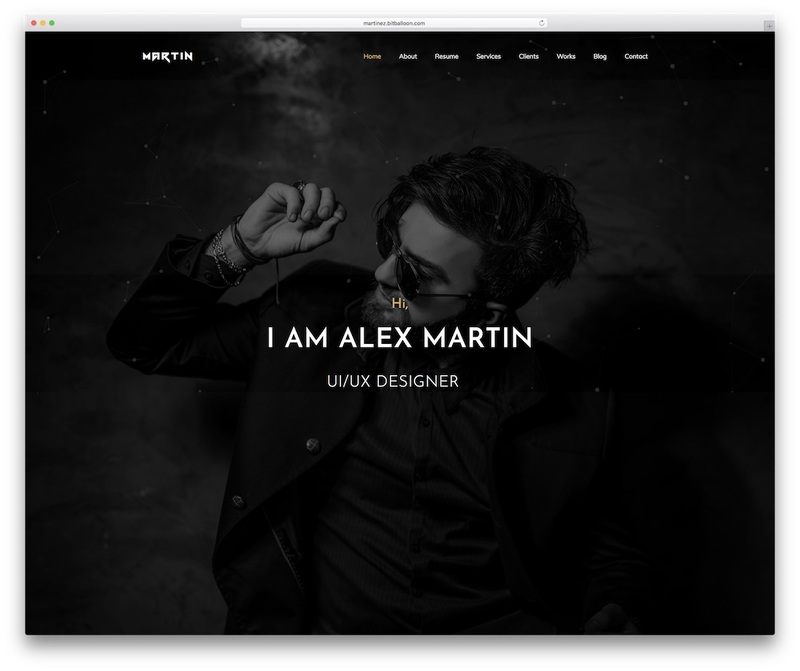 For that matter, Brax personal website template offers unique and light web design. The look will surely catch the curiosity of visitors and onlookers nearby. 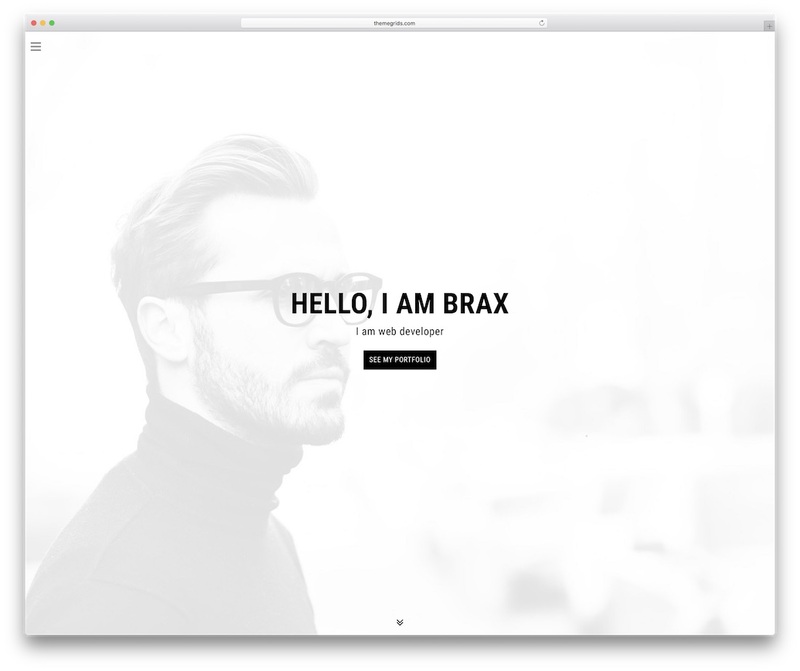 Unlike other web templates available on the market today, Brax offers two remarkable demos, each having its distinct features and purpose. If you are looking to present yourself online with a bang, then you may use the second, the typewriter effect demo. But if you like to keep things simple and smooth, the first, the full-screen version, will do the trick. Other goodies you get with Brax are parallax effect, functional AJAX contact form, cross-platform compatibility and footer reveal feature. If this is the style you dig, there is no need for you to look further. Get things rolling this very moment for an extremely fast personal website creation with the help from Brax. 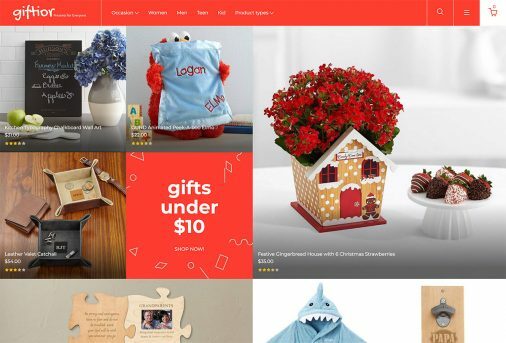 To go straight to the point and present yourself on the internet in the best possible way, Ryan is the personal website template that will do you well. It is responsive, retina-ready and optimized for fantastic performance to ensure visitors’ satisfaction. Besides, Ryan is also simple to use and edit. Make sure you tailor it to follow your branding and stand out a mile. Dark and light layouts, six color schemes and six page transition effects are at your disposal for you to make the supreme mixture of ready-to-use material to suit your work best. With the smallest amount of effort and time, you can have an active page available quickly with Ryan. Just go with what is available and perform minor tweaks where needed and that could already mean you are ready for the launch. Yes, sometimes, even the most complicated things become super straightforward when using the right tools. 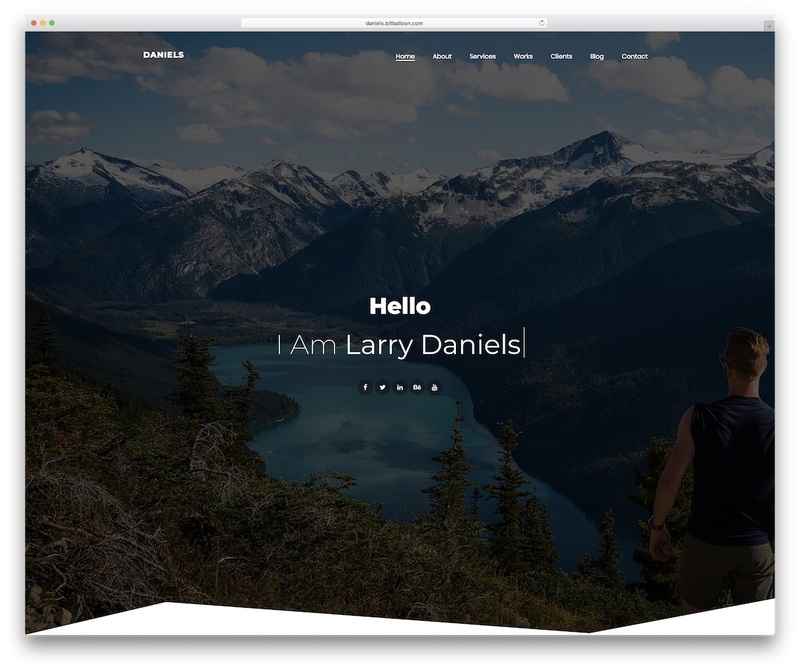 If you want others to get intrigued and interested in what you could offer online, Daniels is the personal website template that you should have. As a one-page portfolio layout whose design expresses minimalism and modernity, Daniels is packed with practical assets to improve your online appearance and brand. Daniels brings to the table the latest version of Bootstrap Framework, four homes, easy customization and all the latest technologies. All and everything in Daniels bundle is coded in a newbie-friendly way so you will never feel lost. Besides, you also get comprehensive documentation that will be of tremendous help if you run into an issue. Daniels is optimized for search engines, cross-browser and cross-platform compatible, mobile-ready and equipped with free updates. Since Daniels is flexible and easy to use, you can expect to have a professional and tempting page all set up sooner rather than later. 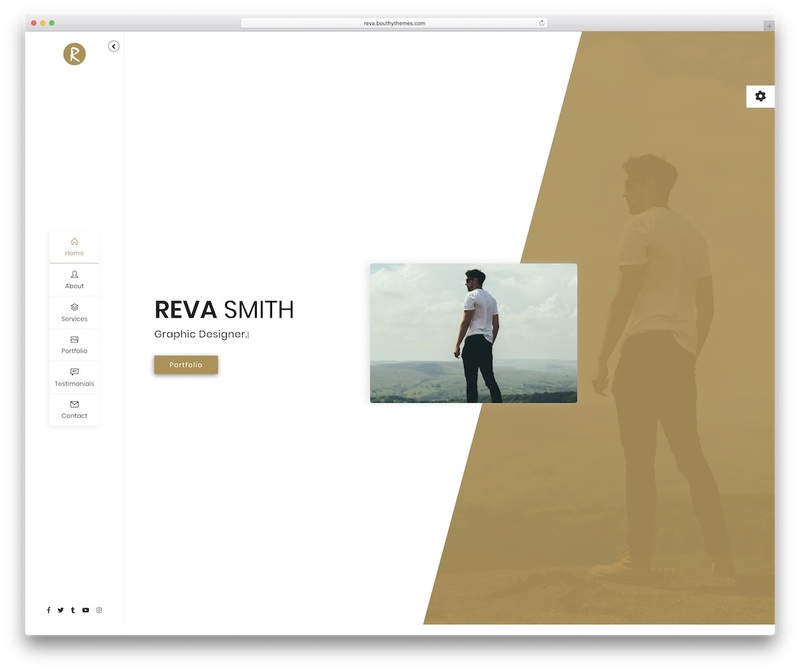 Reva means many things in different languages but in the language of web design, it is an impressive personal website template. With its one-page layout, you can cleverly display your resume on the web and give everyone a chance to skim through your works and skills in little to no time. They can get to know you better without the need for jumping back and forth from page to page. Instead, due to the single-page layout, all your content is presented on one page what makes it very convenient. With multiple homes and multiple headers, dark and light looks, as well as five color presets, you already have quite a few options ready out of the box. Utilize what is at your disposal, enhance it with your personal touch and create a customized version of Reva without a hitch. Do you happen to be a professional looking to have a website of your own? If yes is your answer, then you may want to consider Maria as your new personal website template. This particular page skin is recommended for both amateurs and experts alike because of its high-quality and easy to use files and features. Setting yourself your own personal website or even a business page for that matter just became easier with Maria on your side. Maria works perfectly for creative individuals wanting to showcase and push their work, idea, experience and themselves in general. For a visually stunning Bootstrap 4 template, Maria is a highly suggested tool to choose. In the kit, every Maria user receives nine front pages and eighteen preset color skins. With this two details alone, you have a ton of options to set an ideal face on the web for yourself straight out of the box. When you have no time to conceptualize your own website that will showcase yourself and your work, Dew will make things easier for you. No matter if you have very little knowledge about page development or you are extremely short on time, use what is available and save yourself time, effort and money. 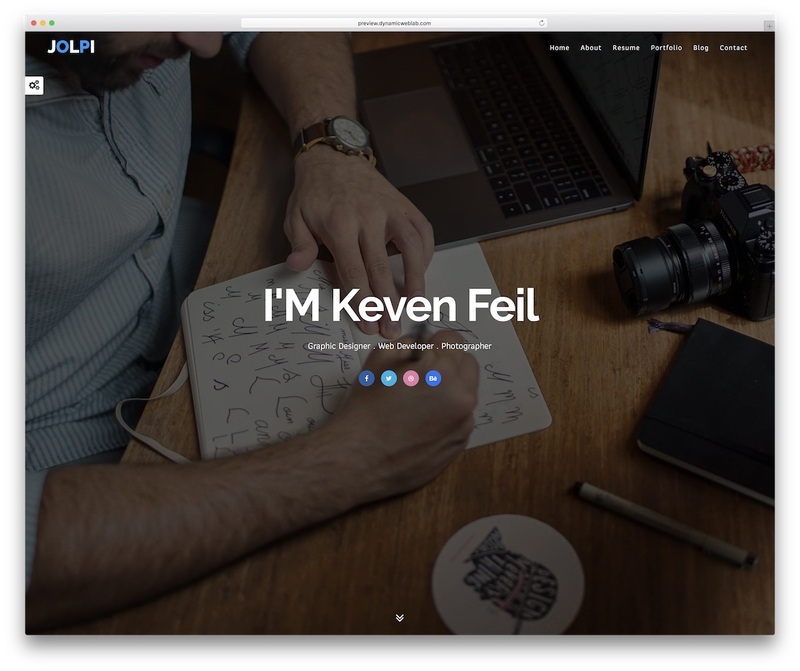 Dew is a fully functional and highly customizable personal website template stacked with awesome material. There are features and predesigned content for seamless and even effortless website creation. Dew is equipped with a single-page layout with two different demos, an image and a video version, both rocking a text rotator. With Dew, you also get a filterable portfolio, active contact form, social media icons and animated statistics. Other traits of this fabulous tool are sticky navigation, parallax effect, clients testimonials and a whole lot more. 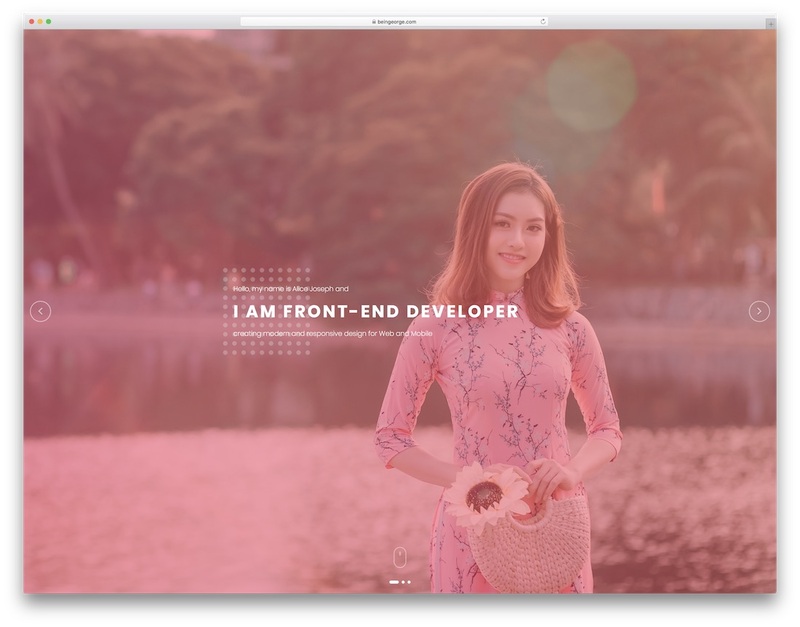 Lina is a personal website template with quite a unique and original web design. It will easily spark the curiosity of everyone ever visiting it. Even when it comes to you, the website owner, chances are, you will be intrigued by the look of Lina in an instant. If you would like to stand out from the crowd, you might want to consider using Lina. It sure is a tool that you do not see on a day to day basis. But it is the live preview page that will best represent what it has in store for you. Moreover, Lina rocks a dark and a light layout with ten color schemes, smooth transitions and live style switcher. You can quickly change the current look of the template and tailor it to your needs and requirements. And if you take the extra step, you can also customize Lina in full and enrich it with your personality. In today’s highly advanced and digitalized environment, resumes and showcasing of one’s persona has gone beyond paper and print. Having a personal website template has become a trend in order to exhibit one’s personal and professional background. On top of that, you do not need to build anything from the ground up anymore. For that matter, Hendrix template offers functionality and aesthetics to digital nomads and experts who are willing to adopt the change. That said, if you are looking to build a career using an online platform, a website is a must apart from social media accounts. With a sleek and presentable webpage through Hendrix, showcasing and expressing yourself will be a notch higher than the conventional way. Hendrix has all the material available, like three backgrounds, six preset color schemes, blog, animations and a working contact form. Look no further and enjoy Hendrix now. Based on the powerful Bootstrap 4 Framework, Profyl breaks the cliche dark or light personal website template. What you get with this particular tool is a refreshing, bright, trendy and clean design. It is best for job seekers, professionals and simple enthusiasts who want to be known for their works and creations. Since Profyl is pliable and 100% adaptable, you can easily adjust it to fit your needs and professional background. Your imagination is the only limitation. With three default and added six niche demos, Profyl may be used for architecture, modeling, wedding planning, medicine and other creative and professional avenues. With Profyl, you are treated to a fully responsive design layout, retina readiness and cross-browser compatibility. Profyl’s one-of-a-kind, yet tidy and smooth UX flow calls for a fantastic experience for users of all devices and browsers. For a creative and contemporary website, you should further investigate Manisa personal website template. The tool is fully stacked with a ton of useful features and assets which you can utilize out of the box. In fact, you might not even need to do much editing. If you dig the style of the predefined demos you like the most, go with it as is. Speaking of demos, Manisa comes with ready-to-use looks that sport multi navigation and multi header styles. Besides, you also get access to light and dark layouts. 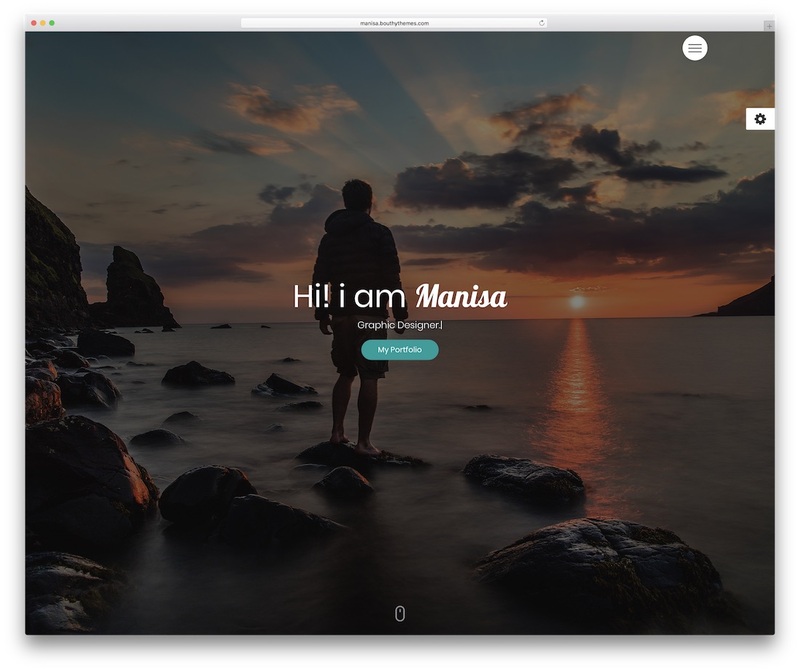 Many other Manisa features include but not limited to smooth transitions, eight colors, contact form, typewriter effect and enticing education and experience timelines. Of course, Manisa also contains a filterable portfolio, massive image testimonials slider, pricing tables and Google Maps. To achieve fantastic results for yourself and your services, let Manisa do its magic and push you through the roof. Jolpai is a multi-functional personal website template, ideal for all types of professionals. Speaking of which, it works well with web designers, digital experts, developers, photographers and the like. If you are looking to expand your reach online through a unique and fully functional website, Jolpai is the way to go. With the tool, your outcome will be a creative, contemporary and clean page that is responsive and mobile friendly. Browser compatibility is inevitable, too. Some of the excellent Jolpai features are all the latest technologies, Google Web fonts, ten preset colors, video support and blog section. For a small investment, you can hammer out the perfect web space to take your project to an entirely new degree. Reach the success you always wanted to see for yourself. Besides, today is the best time to get things going because tomorrow, who knows what might happen. 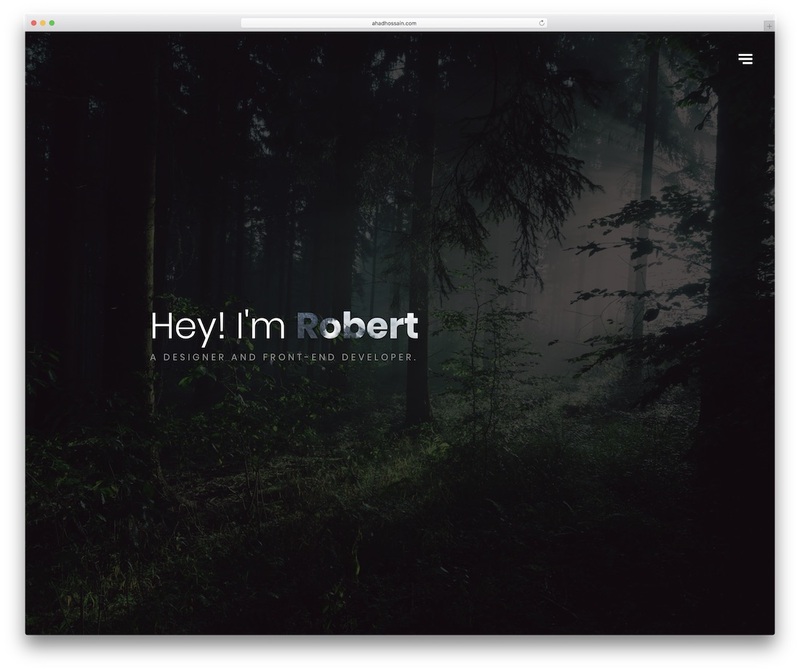 Creativity knows no limits and nor does the amazing and spectacular personal website template, Martin. With four different home page design and an additional blog section, Martin helps you start a page quickly and efficiently. Instead of doing it all on your own and spent countless hours completing the project, let Martin take care of the majority of work for you. After you select the right look for your online space, edit it with your details and information and kick things off solid. Martin is SEO and performance optimized, based on Bootstrap and Sass and fully mobile-ready. Your final product will work fluently on all devices, smartphones, tablets and desktops. Make yourself appear on the web in a professional way, attracting new clients and scale your business over and above. That is very likely to happen if you choose Martin or any other tool in this hand-picked collection of tools. Which Template is Going to Help You? 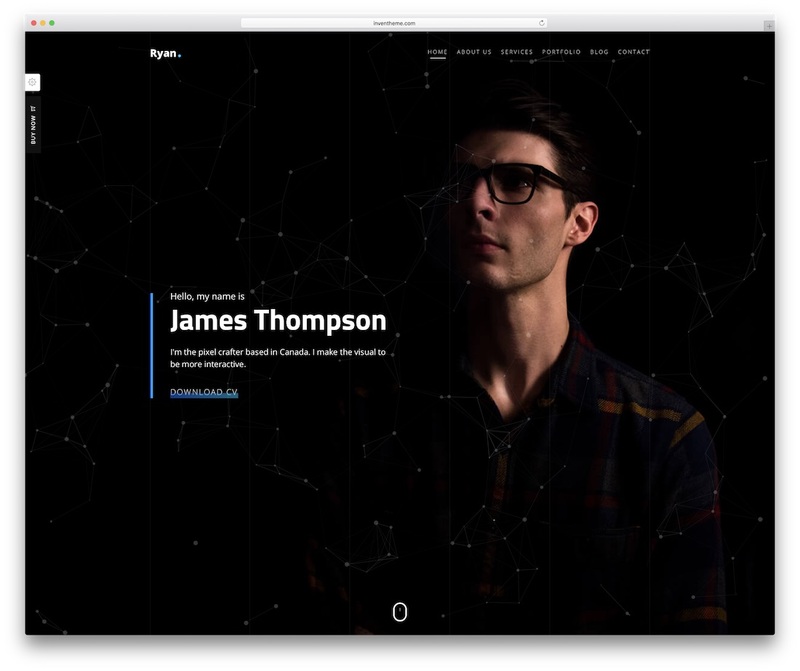 These are the best personal website templates you can make use of your personal sites. As the templates mentioned here are premium templates, you get unlimited customization options and premium support from the theme authors. All the templates can also be used for multipurpose projects. Take a look at our other website template listings and WordPress theme listing to get a better idea of the website you need. 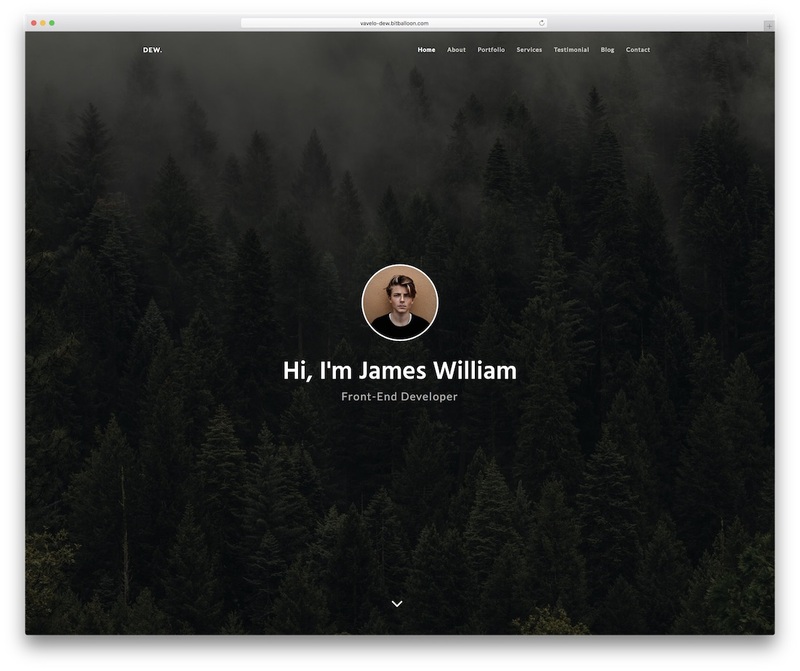 Which template you are using or going to use for your personal site? Let us know in the comment section. Any theme with WPBakery Page Builder (formed Visual Composer) allows this functionality. Just choose a theme with this plugin integration. Most of the listed themes here does have it integrated. But to double check, please let me know themes that you like the most and will let you know if they come with WPBakery or not.